The Panasonic Lumix DMC-FH27 has some good things going for it with a compact body and a versatile 8x optical zoom, but it's video is behind the times. How do you tell if one 16-megapixel point-and-shoot camera is better than the other? We’re here to help you find out before you drop 200 bucks. 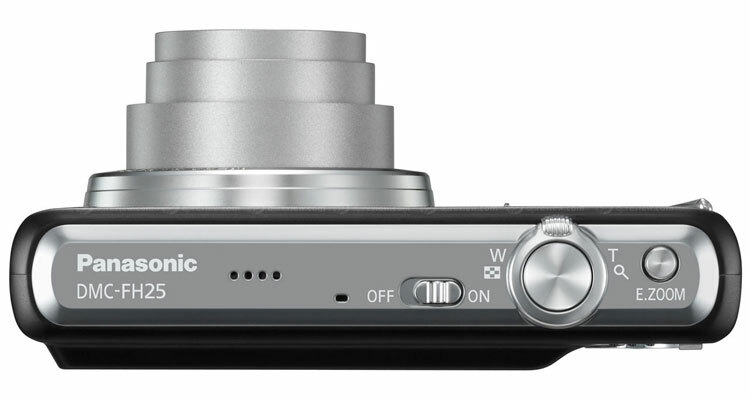 The Lumix DMC-FH27 is a very compact digicam with a potent 8x zoom, potentially making it a good choice for vacationers. There’s nothing as convenient as having a pocket camera with a range of 28-224mm for grabbing nice wide-angle landscapes and group shots along with the ability to zoom in on subjects far away. This camera is hardly unique as Nikon’s new Coolpix S6100 ($199) also has 16MP resolution and a 7x 28-196mm zoom. And we recently reviewed the Sony DSC-WX9, another 16-megapixel aim-and-forget camera but that Editor’s Choice winner has a 5x 25-125mm lens. As we’ll see, cameras don’t live or die on megapixels and focal length alone. The FH27 is available in black, red or silver and it looks just fine—nothing too cutting edge or dull (our review sample was black). It measures 3.9 x 2.2 x 1.1 and weighs 5.6 ounces with battery and card. When powered off, the lens has a nice silver accent while on the far left is a silvery bar that acts as the grip – super sturdy it’s not, but at least it adds a bit of stability. The front fascia is dotted with icons and logos, so it’s a bit much for our taste. Also on the front is the flash and AF Assist/self-timer lamp. The key feature here is the extending 8x Leica DC Vario-Elmar lens. The widest aperture is f/3.3 (w) and f/5.9 (t) so right off the bat you know this baby needs lots of light for best results. The top digicams now have f/1.8 and f/2.0 lenses but they’re a lot more expensive—and mega zooms are never that wide open. The top of the camera has a silver accent and here you see the four pinhole speaker, single pinhole mic for mono sound, on/off switch, shutter surrounded by a zoom toggle and Extended Zoom (E.Zoom) button. This is handy as it lets you zoom quickly out from wide angle to 10x then again to 22x. Tap it once more and you’re back to wide angle. At these higher numbers, resolution drops. Think of it as a tool for quickly grabbing a faraway subject. If you have a moment, just ratchet it back with the toggle to the 8x of the optical zoom to get the full 16MP. The rear of the FH27 has a few raised bumps on the top right that act as a thumb rest, a 3-inch LCD screen rated a decent 230K pixels and that’s it. There’s no mode dial or four-way controller with center set/OK key or anything else. You’ll make all of your changes using your fingertips or the stylus on the touch screen, just like the new Canon PowerShot 500 HS. Whether this is a good thing, we’ll let you know shortly. On the right side is the eyelet for the wrist strap and a compartment with USB-A/V out. Here’s where Panasonic should take a look at the competition such as the $299 Canon ELPH 500 HS – this touch screen camera is supplied with a stylus but it’s integrated with the strap so you’ll never lose it. Knowing our propensity for misplacing small objects, we attached Panasonic’s stylus to the strap. It looked like something from a locker room but at least we knew where it was! A much more important issue was the fact the camera only has an A/V out. Where the heck is the mini HDMI out for the 720p video? The Nikon Coolpix S6100 has one as do many new cameras with HD movie capability, but no luck here. This is a big strike one for the FH27. The bottom of the Made In China digicam has a metal tripod mount and compartments for an optional DC coupler and the battery/SD card. The battery is rated 250 shots per CIPA which is good for a touch screen model. 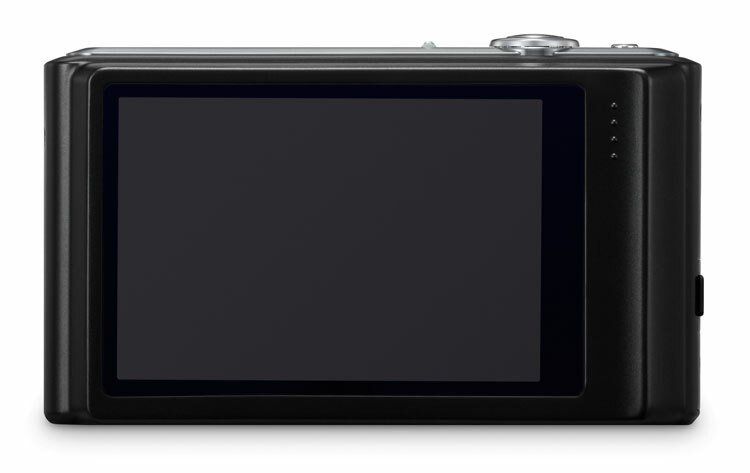 The Canon 500 HS with a slightly larger and better screen (3.2-inches, 461K pixels) lasts for 180. The Panasonic accepts newer SDXC media and you should use Class 6 or higher for best results.